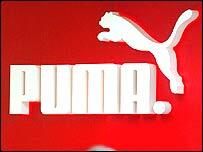 Profits at German sports kit maker Puma fell sharply in the final three months of 2006 despite a jump in sales. The sports goods producer made 32.8 million euros ($43m, £22.2m) profit, down 26% on the previous year and below analyst's predictions. The group put the drop down to rising costs incurred as it expanded its operations and restructured its marketing and product development. But, sales rose 37% during the period to 480.6m euros ($632.4m, £324m). Puma - Europe's second largest sports good maker - added it had also spent more on designing new shoes and advertising its products. Looking ahead, the company said it expected 2007 sales to increase by a mid to high single-digit percentage rate and net profit to rise at least 10%. The Herzogenaurach-based firm's sales have increased five-fold in the past six years.